Rasolnic is made like at home. It has a rich taste. It consists of potatoes, pickled and salted cucumbers, onions, pork meat, carrots and barley. Preparation: 3-4 portions from one jar. 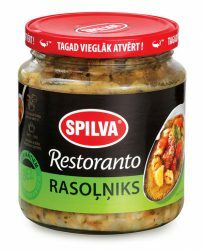 Mix the Spilva Rasolnic soup with water 1:1 and warm up for some 3-4 minutes. Serve with sour cream and greenery. Product is packed in 0,58 l glass jars.Shelf life non-opened – 24 months. Product 100g contains – 121,1 kcal (507,6 kJ) Nutritional value: Carbohydrates 14,2 g, Protein 3,2 g, Fat 5,7 g.